The adidas Ultra Boost are Adidas’s flagship running shoes. According to adidas, they provide a new boost foam in the midsole, which will provide a cushioned and responsive feel, returning energy with every step. The shoes also include a TORSION® SYSTEM, allowing for a more natural motion, along with a stretch web outsole that will adapt to the runners foot strike. Being a long distance runner, I was naturally intrigued. Forking out £130 for a pair of running shoes is a fair investment, considering that running shoes are a disposable product. Running experts recommend that running trainers are ready to be retired after ~700 miles. I myself currently run around 80km/50miles per week, meaning that if I used these shoes exclusively, they would last me around 4 months. Anyway, onto the shoes. First impressions out of the box are very positive! The shoe is sturdy, well constructed and seems to be light enough for long distances, yet cushioned enough to provide adequate support. Slipping on the shoes for the first time is a satisfying affair. I ordered a size 6.5, and I can confirm that they do fit true to size. The toe box leaves me with around 1/2 an inch to spare at the front, and the sides provide an overall snug feel, without feeling too tight. The advertised weight of the shoes is 302 grams for the 8.5 size, so not the lightest running shoe. But it is important to note that the shoe does not feel heavy or bulky, at all. The entire upper part of the shoe is a continuos piece of material, a mesh dubbed by adidas as the “Primeknit” (Nike Flyknit anyone?). The first thing I noticed when I walked around in the gym with them, briefly before my test run, was that the plastic support on the sides was a little tight, and I could definitely feel its presence with each step I took. I wondered how much this would bother me during my run. However, after wearing the shoes for a while, I did not notice this and it soon was not an issue at all. I took the Ultra Boosts for a speed trial on the treadmill. The workout was as follows: 400m at 18km/h, 200m recovery at 8km/hr, repeated for 5 sets. Running at both high intensity running and jogging was comfortable, smooth and responsive. 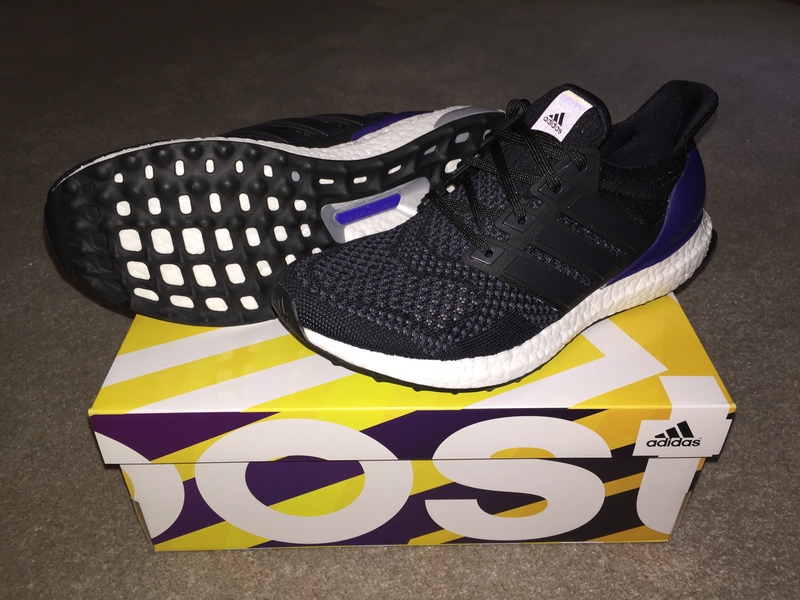 The Ultra Boost’s have a great feel to them, and each stride I took was bouncy and supportive. The only slight reservation I have about thee shoes is the Primeknit fabric. It is light and meshy, and I am slightly concerned about how well it will hold up over time. I noticed my Hallux (big toe) slightly pushing up on the mesh at the front of the shoe, and this worries me about a potential pressure point developing, which may eventually lead to a tear in the fabric. Adidas claim that the fabric is stretchy and adapts to the runners foot, which seems plausible as the fabric does indeed have a stretchy feel to it. Owing to this, I hope my paranoia is ill-founded, as the run in these shoes is truly remarkable and comfortable, and I would like to get 100s of miles from them. This leads me nicely to my next point. As the Ultra Boosts are essentially a fabric based running shoe, I would definitely suggest that they are more suitable for non-wet conditions/treadmill runs only (which may be a huge compromise living in England, where wet weather is common). Due to the breathable mesh, water can easily penetrate through, and the last thing any runner wants is wet feet during their run! Conclusively, would I recommend the Ultra Boosts? In a word, yes! They are arguably one of the most comfortable running shoes that I have ever owned, and seem to be ideal candidates for long distance events (anything over a half marathon), due to the combination of their cushioned sole and light-weight upper body. I sincerely hope that they stand the test of time, and if so, would definitely be looking to run all my races in these. Well, until I find a more superior running shoe! Until then, it seems like the Ultra Boosts will be living up to their claim as the “best running shoes in the world”. PS: I have heard good things about the Nike Free 5.0s, which are next on my shopping list. UPDATE: So last Friday (8th March) I took the Ultra Boosts out for a quick 8 miler. I completed the distance in just over 54 minutes, which places it at under a 3hr marathon pace. The shoes were immensely comfortable and I can say with some confidence that they will be suitable for both half and full marathon distances. Admittedly, they did seem very slightly heavier than I would like, but were responsive and well cushioned. I plan to wear them this weekend at the adidas Silverstone Half Marathon, and will provide an update with my thoughts following the event. UPDATE 4TH APRIL 2015: I have now logged over 100km with these beauties. The shoes are still holding up well and reservations I had about the prime knit fabric tearing have come to pass, as they seem to be intact, thus far. I am running Brighton Marathon next Sunday, and strongly considering these as my marathon running shoes now. The only slight negative about the Ultra Boosts so far is that the sole is showing some signs of wear, and I am a little skeptical about how long they will hold up before the sole wears down entirely. I’ll be sure to update with how things progress in terms of durability. UPDATE 27TH APRIL 2015: To-date, I have logged 203km. The soles are holding up fairly well, but the small rubber studs on the bottom are wearing out now. The upper prime knit fabric is still intact. I clean my shoes after every run, so they are still looking in pristine condition. Hope to get at least 500km from them, and will probably reach that number fairly quickly as the Boosts are now my go-to shoe, as they are easy to slip on and very comfortable! « Can running help ulcerative colitis? Any updates regarding shoe’s durability? To-date, I have logged 203km. The soles are holding up fairly well, but the small rubber studs on the bottom are wearing out now. The upper prime knit fabric is still intact. I clean my shoes after every run, so they are still looking in pristine condition. Hope to get at least 500km from them, and will probably reach that number fairly quickly as the Boosts are now my go-to shoe, as they are easy to slip on and very comfortable! do the ultra boost has the micoach cavity? I know it’s an edge case and wouldn’t recommend anyone else do it but I have a pair of ultra boost that I’ve been using steadily for for over a year and I’ve logged just over 1350 miles on them. There is some obvious wear issues in the upper but the foam and tread are still great. I did a 20 mile run in them on two weeks ago followed by a 20 mile run in my replacement pair and there really is no noticeable difference in the feel. That is really good going! I am on my second pair of boosts, hoping they will hold out longer than the first pair which did around 400km. The issue with mine were that the material near the toes began to get holes. But on a positive note, I have managed to wear the first pair casually since I stopped running in them.